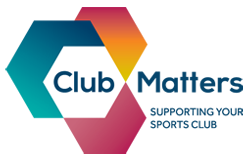 Sports England has launched Club Matters - a free and practical toolkit to help those involved with running a grassroots club. Whether you’re a club chair writing a plan to attract new members, a treasurer managing those all-important club finances or a captain asking existing club members what they want, Club Matters can help clubs to thrive. The new one-stop shop brings together all of Sport England’s previous support projects – Club Leaders, Clubmark and Help for Clubs – into one simple online resource that provides free, convenient and practical resources to help you develop and run a sustainable club. * Mentoring – Either for long-term support, or just a short call to sound out ideas, Club Matters’ ﬂexible mentoring scheme offers personal support at a time and place to suit. * Club Improvement Plans – Online resource for clubs of all sizes and at all stages of their development, to establish where they are performing well and where they can develop. * Club Views – A club survey tool helping users to ask members and volunteers what they think about their club, and make suggestions. * Clubmark – The nationally-acknowledged accreditation scheme for community sports clubs. As part of Clubmark accreditation, clubs will have the opportunity to request a Club Matters mentor to help them through the accreditation process. * Online Support – Help and guidance in all areas of running a sports club. This includes online toolkits, quick reference guides and e-learning modules. Sport England Chair Nick Bitel said: “Sports clubs play an important role in community sport – providing sporting opportunities for millions of people every week. “But clubs need committed people to run them. It’s the people who organise the events and encourage new members to join that keep clubs going. They’re the ones that can benefit directly from this. “Club Matters has been carefully designed to give those involved in running clubs what they want, in a simple, easy to access way. We’ve worked to create a single support package which is open to any club that wants support and information. And importantly, it’s free. Over the next eight months, Sport England will be holding sessions throughout the country to demonstrate the benefits of Club Matters to people from sports clubs, sports governing bodies and county sports partnerships. To find out more about Club Matters visit www.sportenglandclubmatters.com.